There are more questions than answers about the mysterious death of the 129 who went to search for the fabled North West Passage in 1845 and never returned. There have been more questions than answers for 170 years since hopes began to fade that the Erebus and Terror would emerge from the Arctic bearing celebrity adventurer Sir John Franklin, perhaps triumphant in his discovery of a new trade route to the Far East. It was Sir John’s wife Jane who was the driving force behind more than 30 searches to find answers, crews risking the same ice-bound, slow-death fate as the stricken Franklin expedition. She fired letters to politicians and celebrities – including Charles Dickens – seeking money and support. Over the years, the searches yielded clues – the famous Victory Point note confirming Sir John’s death which came before the decision to abandon ship; traces of the ship’s equipment absorbed by Inuits for their own use. Bones and bodies told stories of deprivation, sickness, but untouched tins of food suggested there was still enough to survive. How they died – TB, lead poisoning, hypothermia, scurvy, cannibalism; why they abandoned ship; and, of course, whether they did find the passage, have become rich sources of debate for years, right up to the present day when some of the greatest breakthroughs have been made. In 2014, the wreck of the Erebus was finally found. In September 2016, the Terror was discovered, both vessels still to be thoroughly investigated in the 10 weeks or so a year they are accessible in the thick sea ice. 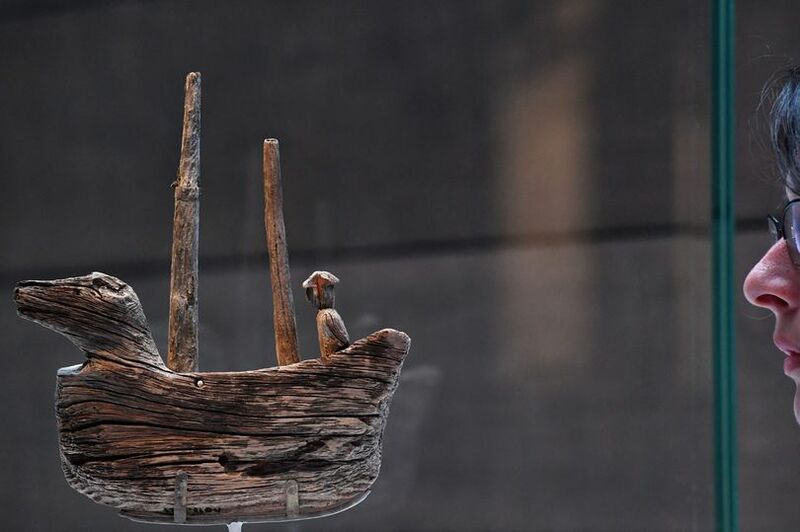 These latest discoveries, and how they re-write the century-old legend, is the subject of a new exhibition at the National Maritime Museum, Greenwich, which brings together artefacts and clues. It weaves a story not just of another derring-do Victorian adventure gone wrong, but of men, who spent years hemmed below deck, keeping themselves occupied in the empty, freezing landscape, fighting, then accepting, the creeping realisation that these hardy ships could also be their tombs. The exhibition features the famous Victory Point note, the Inuit weapons, compasses, boots, messages, and dozens of other original objects. It plays out to the haunting whistling of the Arctic wind and is steeped with a sense of loss and foreboding. Inscrutable faces of long dead sailors stare out from daguerreotypes. The theory that has become fixed through time is that the remaining crew abandoned ship north of King William Island with the intent of walking south. A trail of bodies suggests that route. However, the wrecks were eventually found south of the island and evidence collected thus far, together with eyewitness accounts from the Inuits, suggests that the ships were re-occupied. Whether a group stayed behind, or some went back, whether this was a collective decision or the product of division is a puzzle which, like the Arctic itself, is challenging terrain – compelling, intriguing and resistant to the ill-informed conquerer.